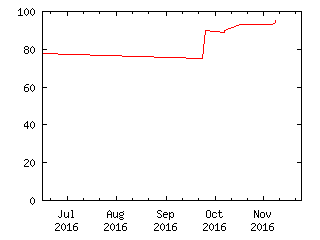 This is a scaled claim that pays 50 times the percentage of votes cast for Gary Johnson in the 2016 U.S. presidential election. If Gary Johnson receives more than 2% of the popular vote, this claim will pay 100. The judge will choose a sufficiently authoritative source of vote totals to administer the claim, such as the U.S. Federal Election Commission. The claim shall be judged ahead of the judging date if the outcome is clear. I will judge by the intent of the claim in the event of ambiguity.